Today was grocery shopping day and a lunch date at the new (and awesome and crowded) Pine Street Market. First, I learned about dining out with food restrictions. I completed a vegetarian challenge last year, so I’ve had a little practice filtering out what I’m “allowed” to eat within the scope of my challenge. I looked first at getting a bowl of Bibimbap, but between the sauces, (likely sugar-)pickled veggies, and the white rice, determined that was out. Ramen, with its white flour noodles, was also a firm no, as was pita from the Israeli cart, hot dogs from OP Wurst, and I didn’t even spare a glance for the soft serve at Wizbangbar. This left Pollo Bravo, a Spanish-inspired tapas bar, as the most likely answer. The dishes I chose likely did have a *bit* of sugar in them, or weren’t the healthiest: thinking of you, flash-fried but delicious cauliflower. It was closest to the nature of the challenge though, and this was what I was looking to prioritize. Side note: food challenges are a good practice in empathy. Not being able to eat absolutely anything in sight at this varied and eclectic food market was an uncomfortable change for me. My heart goes out to those restricted by allergies, gut intolerance, or religious conviction from eating some of these delectable offerings. Vegetarians I pity less — that one’s your choice. But if I thought avoiding sugar in food was tough in a restaurant, this was even more of a surprise at the store. I was craving some dried fruit, and dutifully checked the labels on the back of the packages. Nearly everything had added sugar (! ), including dried bananas, cranberries, cherries and mangoes. Luckily I found a bag of Sun-Maid Mini-Snacks raisins that miraculously only listed grapes on the label (as though they were the only ones that thought fruit on its own was sweet enough). So I had my first box of raisins in about a decade, and had no complaints. Really, they’re not that bad when you can’t have a slice of cake instead! After dinner, I was still left craving chocolate, and remembered that I’d stashed some homemade chocolate syrup (cocoa powder + maple syrup only) in the fridge. Even so, it felt a bit like cheating when I made myself a hot chocolate at the end of the day. It wasn’t the same as that raspberry croissant at the market, or the box of M&M cookies sitting on the counter at home, but it felt against the spirit of the challenge. So here’s to hoping for an equally tasty day tomorrow, though perhaps more in line with the core of the challenge. The ‘100 Days of Real Food’ Challenge advocates the eponymous goal of eating only real food. ‘Fake’ foods are things like processed sugar (white, brown, turbinado, cane), processed flours, and laboratory-invented ingredients. There’s also an emphasis on organic foods, though I don’t find health-related organic claims to be that convincing. This challenge is a nice halfway point to the zeal of Whole30, and still allows for whole grains, caffeine, and natural sugars in moderation. I’m cancelling my gym membership tomorrow, to buck the usual trend of joining with the new year. Part of this is that I don’t go; it’s a lot of effort to run to the gym through the cold, sort out a working treadmill from the 1/3 that are usually broken, and to endure the perceived judgement of the free weights crowd. I’m already signed up for DailyBurn (which I really enjoy) for strength-training, though I’m a little removed from this as well. So into my exercise hiatus appears an opportunity to practice yoga for 31 days with Adriene (YouTube Yogi SuperStar). I’ve been dipping into some of her previous 30 day challenges here, but haven’t fully committed to a yogic month. Her new “Revolution” series is a full 31 days, and I’m signed up for the ride. Yoga I find to be great for my mental health, and I’d like to prioritize this for January. I have a difficult time claiming it’s as good for my fitness as DB or a run, but hopefully by building a yoga habit I can sub in DB once the 31 days is up. 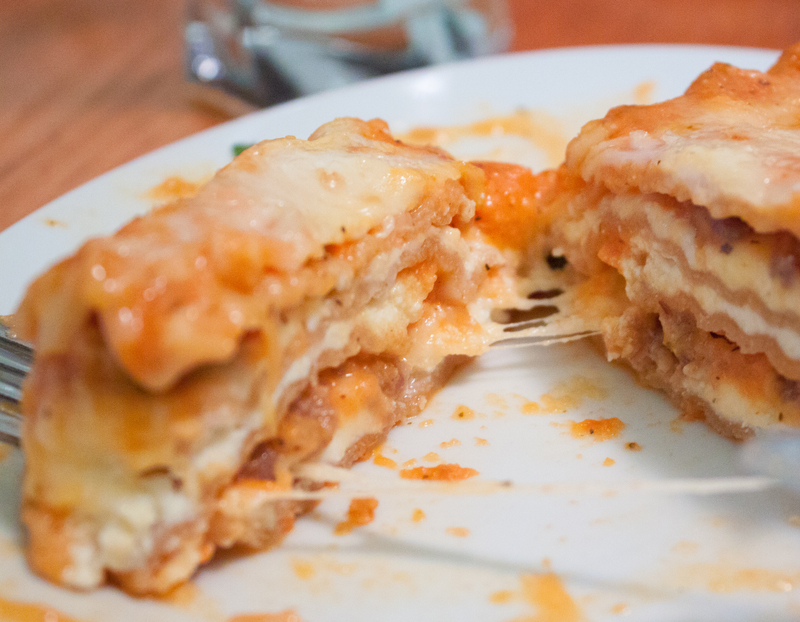 This time last week, I embarked on an epic adventure – Lasagna Alla Vodka. Sure, you’ve seen penne alla vodka before, and I’ll bet you have a favorite recipe for lasagna too. Now combine the two and we’re onto something big. The BF and I are big fans of both, and the BF might be the biggest pasta fan out there. In an attempt to make this something really special to kick off his birthday celebrations, I spent all of last Sunday cooking like crazy. Today I present to you the first step in this beautiful meal. I was inspired by this mish-mash of images that Buzzfeed took from around the interwebs, so I roughly followed their instructions to poach and peel my own whole roma tomatoes, a feature ingredient in every quality vodka sauce out there. The good news: it worked! And it was easy! The bad news: this adds a considerable amount of time to your lasagna making. If you start with this step in the recipe, be prepared to add an additional 30-45 minutes of prep-time. It is slightly more cost-effective to do so when tomatoes are in season, and will create a creamier sauce that will save you a few calories along the way since you will need to add less heavy cream to the finished product. 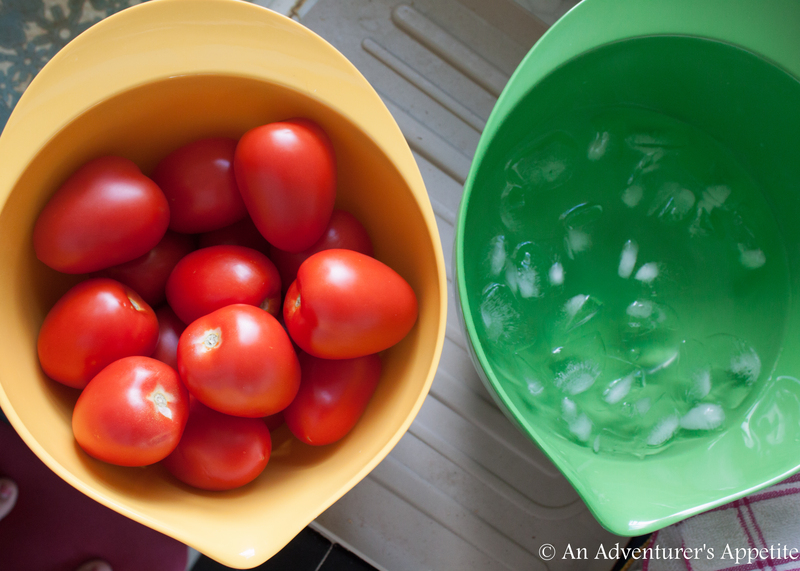 To begin with – gather tomatoes and prepare a large bowl of iced water to blanch your tomatoes. Start a large pot of unsalted water to boil. There should be enough water to full submerge the tomatoes. For my recipe, I used 15 roma tomatoes, or about 2.5 pounds worth. Next, core and score all of your tomatoes. Don’t worry about scooping out all of the seeds; they will cook down and puree later. Just remove the stem for now. For scoring, you can make a deep cut across, or actually score the skin lightly, whichever is easy for you to handle. 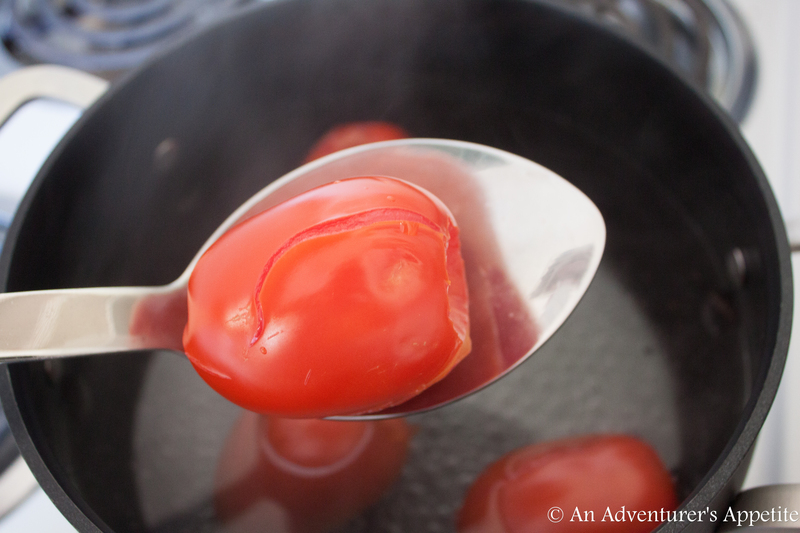 Working in batches, place tomatoes in the boiling water. I was able to fit about 5 at a time. Boil until the skin begins to crack in such a way that it will be easy to peel, or for up to 1 minute. Once the cracks are visible in some of the tomatoes, dunk the tomatoes into the cold water for 1-2 minutes. 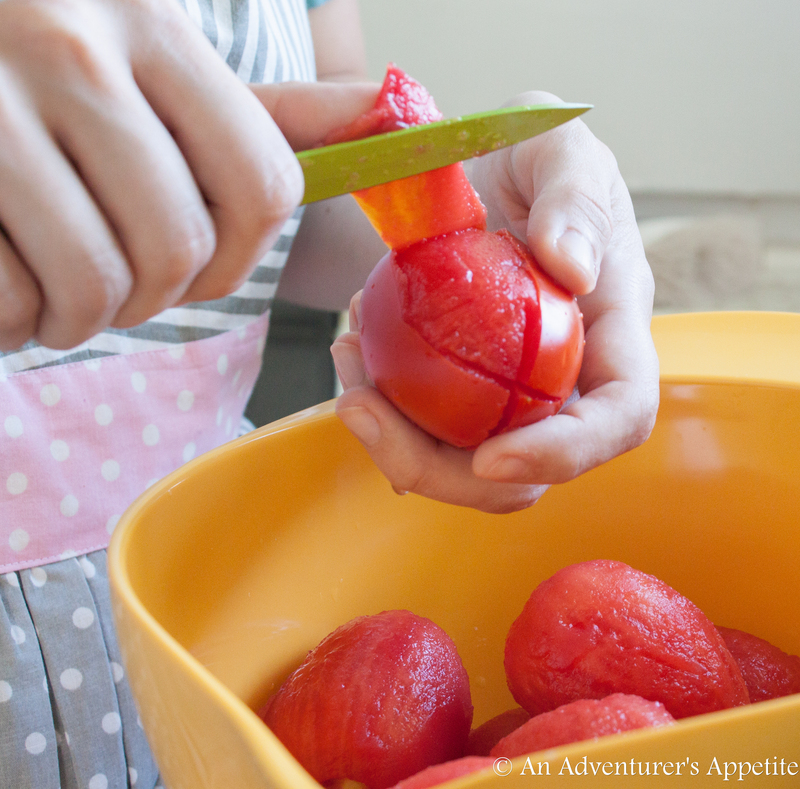 Peel the tomatoes with a paring knife or your fingers (or a combination of both!) and place in the medium bowl. 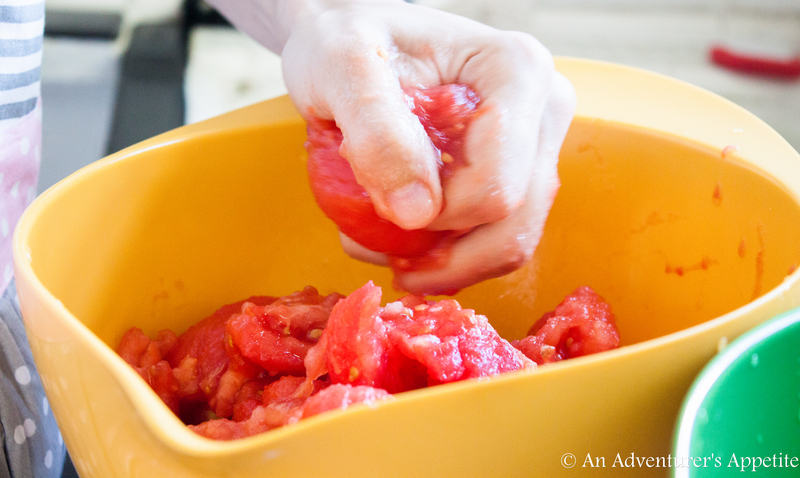 Break apart the tomatoes gently with your hands, using caution not to spray tomato juice all over your kitchen like I did. Set aside while you continue with your sauce. Stay tuned for Part 2 coming tomorrow: Making the Sauce! Fill a larg bowl with ice water. Boil water in large pot, using enough water to cover the tomatoes. Working in batches, boil as many tomatoes as can be submerged in the water for up to a minute, or until the skin begins to peel back from the tomatoes. 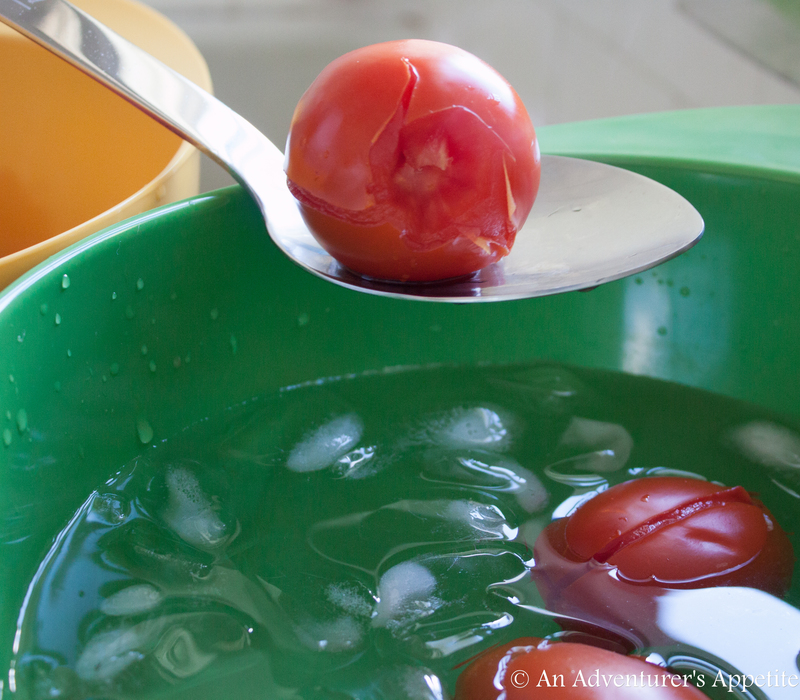 Move boiled tomatoes to the ice water bath to blanch the tomatoes. 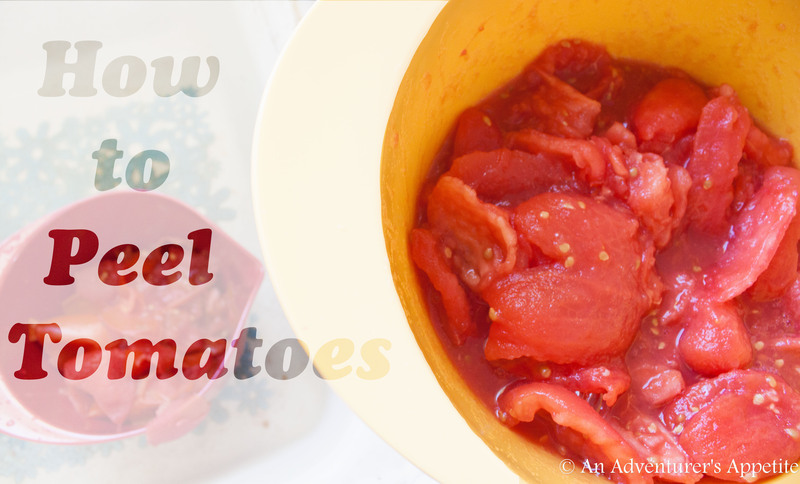 Allow tomatoes to cool 1-2 minutes. 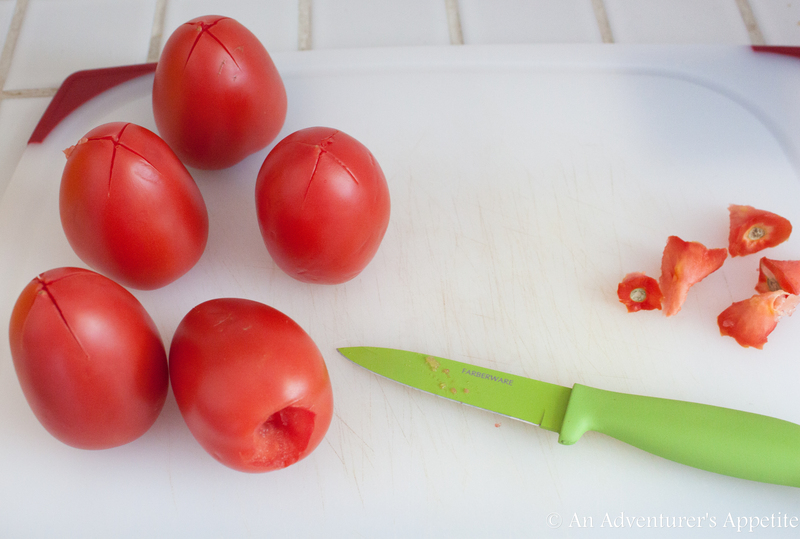 Peel tomatoes gently with a paring knife or with hands. Repeat with all of the tomatoes. Crush tomatoes in half to break open for juices. The weekend is here, and not a day too soon! 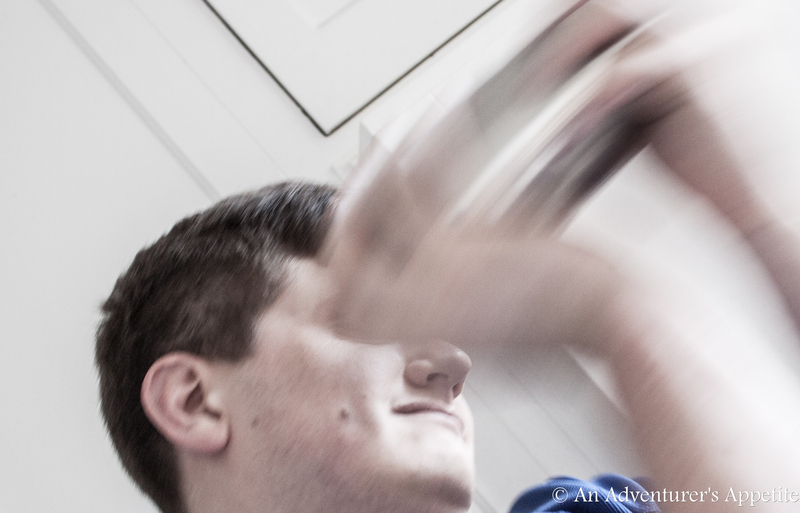 The BF is celebrating his birthday on Monday – coincidentally on his first day on the new job too! So we’re celebrating in advance to usher in the holiday, the weekend, and the birthday celebration. To me, they’re one day or weekend (or heck, week! ), that can be unabashedly about you! Unlike thanksgiving, in which we come together with family, or Christmas, which we share we thousands of others, birthdays are often celebrated for one person alone. 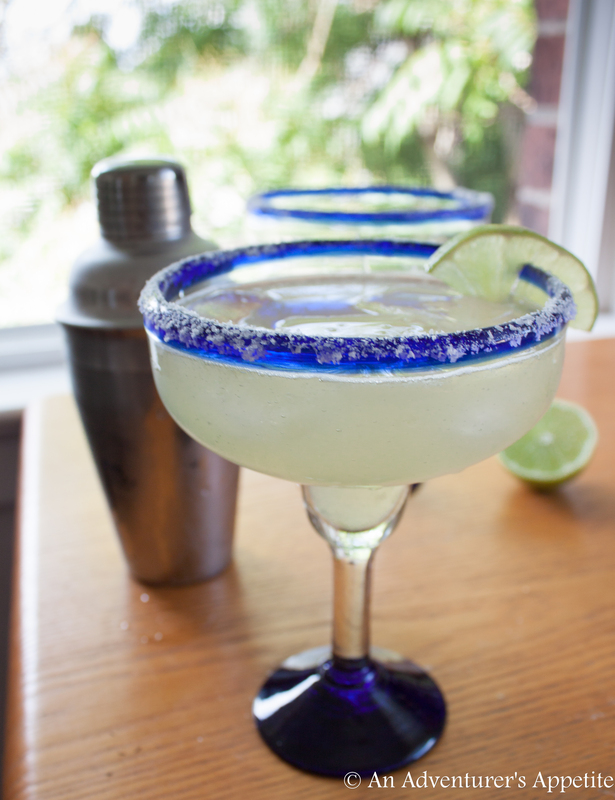 So day 1 of our birthday bash and pre-4th of July celebration is a Margarita Day! Also – new festive glasses + cocktail shaker. Yay, festivities! This recipe is from Bon Appetite’s “The Secret to a Perfect Margarita“, and it is pretty spectacular. It might even be better than a Donny T’s margarita in LexVegas. So squeeze out a couple ‘a limes to get started. No key lime nonsense. 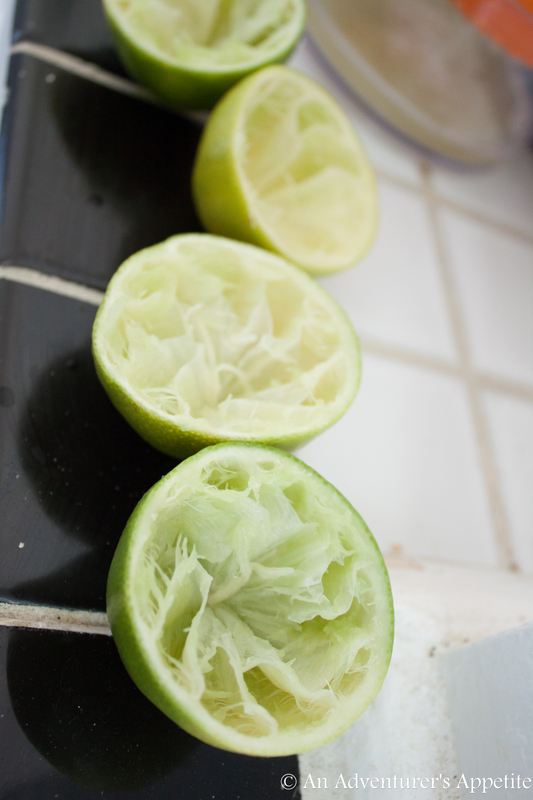 Big, fat, juicy limes are way more time/cost/energy efficient. Organics for us were $0.50 each, but lovely and limey. 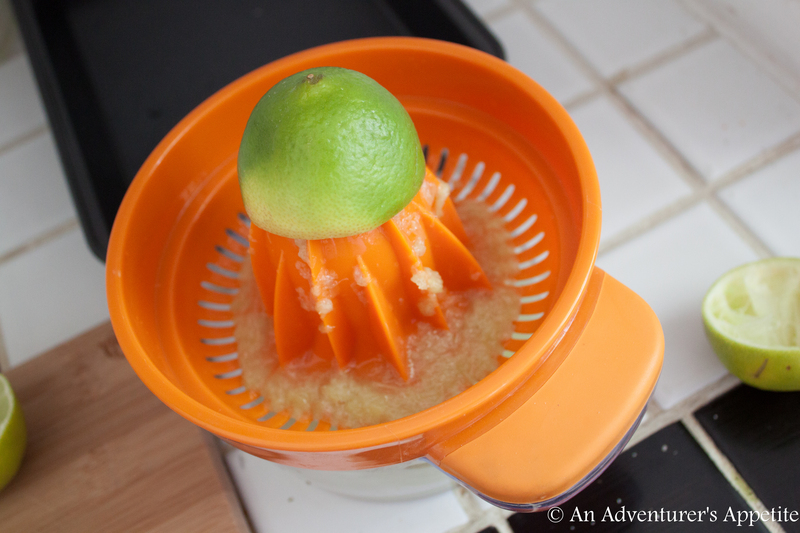 This catch-all juicer is great. But if you don’t have one, just roll the whole lime back and forth real quick to warm up the juice, then cut and squeeze. Use a fork to press out any additional juiciness. But if you plan to make margaritas often, I highly recommend the upgrade. 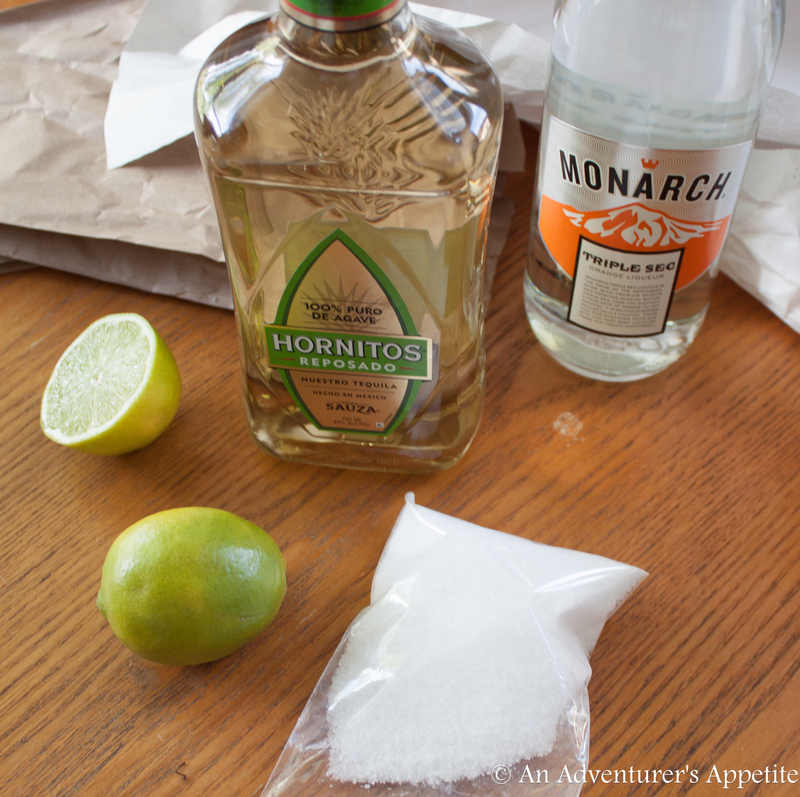 Add some fanciful tequila, and scale up to Reposado if you’d like to up your game. This is the first type of tequila that goes through an aging process. Tequila = Extra Anejo > Anejo > Reposado > Oro > Blanco. And since we’re not drinking the tequila straight, the reposado, with 100% agave, will go down smoothly and blend nicely with the 3 other ingredients in this drink. Petron is crazy expensive – try some Hornitos or a comparable reposado tequila for half the price. Pour tequila, triple sec and fresh lime juice over ice. The birthday boy even did the honors! So check it out! Bon Appetite’s recipe is spot-on. Shake to combine, and pour over a handful of ice cubes in a festive glass. 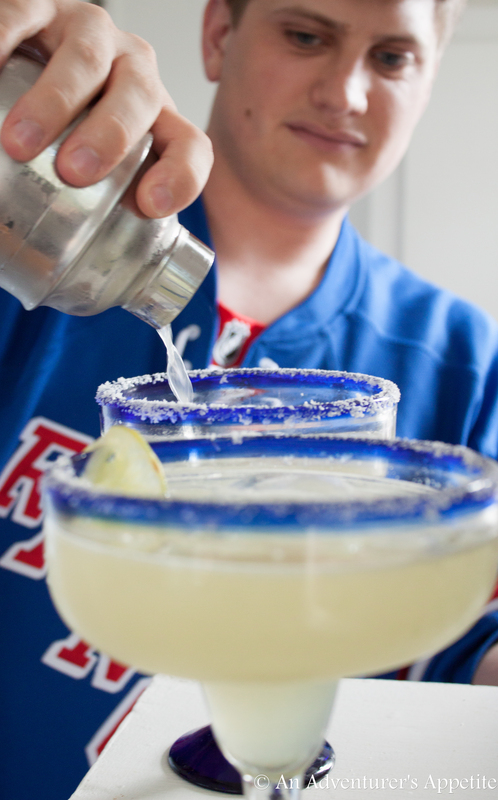 Makes: 2 generous birthday-sized, 4th of July-ready margaritas! Doesn’t it always seem like banana bread recipes call for an entire bunch of bananas? For me, banana bread is a treat I make out of ingenuity and necessity rather than careful planning. Complete with a reusable sandwich bag! And then a quick internet search reveals that I don’t have even close to the recommended number of bananas. Sure, sometimes it’s possible to divide a recipe in half. But it’s awfully hard to divide a recipe in half that calls for 3 eggs, or even one! And it is possible to do some complicated math to 2/3 a recipe, but I would just rather have a no-fuss guide. After some googling research, here is my banana bread breakdown! 6 Bananas: For those times when you actually do forget about an entire bunch of bananas, check out this Six-Banana Banana Bread over at Averie Cooks. This recipe is perfect for those who worry about “wimpy or lackluster banana flavor,” and need an in-your-face breakfast treat. 5 Bananas: Did you know that every recipe calling for 2 and 2/3 cups bananas is actually calling for 5 bananas? This recipe comes from a blog post “5 Bananas, People!” in the minimalist blog Obvious State. The pictures to this bread look densely delicious, but now you know you can use 5 bananas for any 2 + 2/3 quantity of bananas. 4 Bananas: To mix up the list, this “Jacked Up” banana bread recipe calls for vanilla and bourbon, and makes 2 whole loaf pans. (1 for you, 1 to share?) “Elise’s Friend Heidi’s Friend Mrs. Hockmeyer’s Banana Bread, As Jacked Up by Deb” actually calls for 3-4 bananas, but more bananas will give the bread a smoother texture. 3 Bananas: For a heart-healthy oatmeal banana bread with 3 bananas, Joy the Baker has an excellent “Low Fat Oatmeal Banana Bread.” Her recipe comes in at 4 points per slice, and is great for a half-bunch of dropping bananas. 2 Bananas: I have two recipes that I use personally when I have 2 bananas leftover for a treat, and both come from the monolithic recipe bank Allrecipes. The first is a rich banana bread stuffed with sour cream, and the second is a spectacular pumpkin banana bread. And finally my own 1 Banana recipe! This was adapted from the Sereneity Now blog, the “Banana Bread Recipe with One Banana.” I’ve added some oats, subbed out the white sugar for brown and traded some for natural maple syrup. There’s less butter with some yogurt instead, as well as the addition of cinnamon. The stronger you would like the banana flavor to be, the riper the banana should be before mashing. That said, this recipe is also perfect to serve to those with anti-banana preferences. The maple and pecan shine in this recipe, with the banana playing second fiddle. 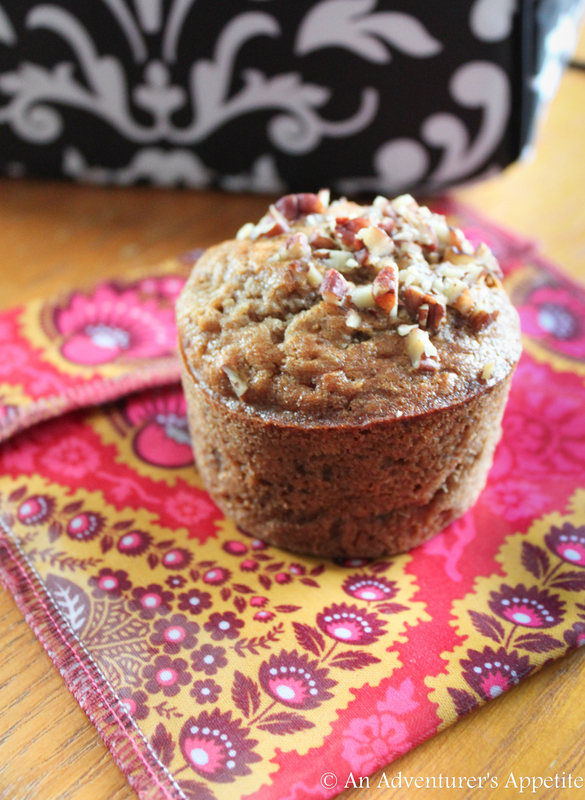 Put another way, this recipe is great to make when you’re tired of a 1-note banana bread! 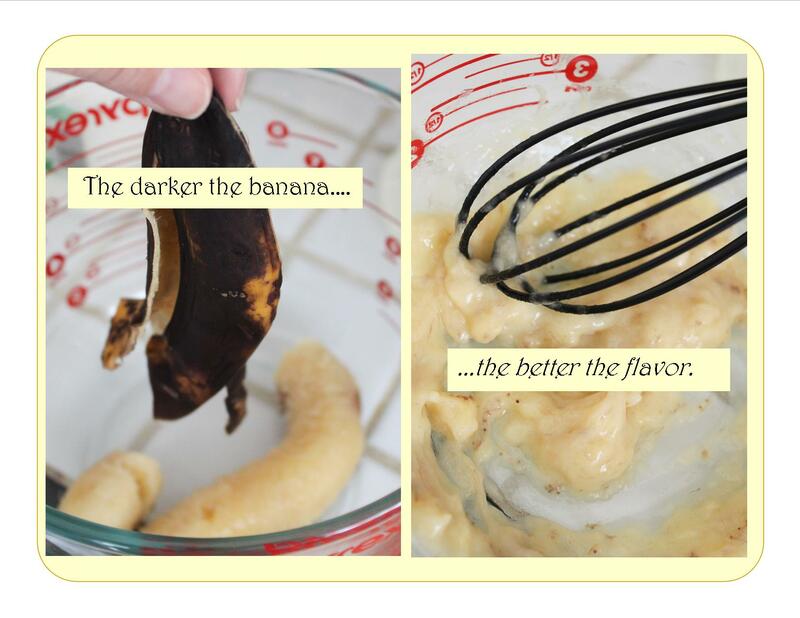 In a large mixing bowl, mash the banana until it achieves a smooth consistency. Whisk in the egg, milk, maple syrup, butter, yogurt and vanilla, pausing to incorporate each one. In a separate medium bowl, stir together 3/4 cup flour, the oats, brown sugar, baking soda, cinnamon and kosher salt. Stir the dry mixture into the wet, adding the additional 1/4 cup of flour if you would like a more cake-like consistency. 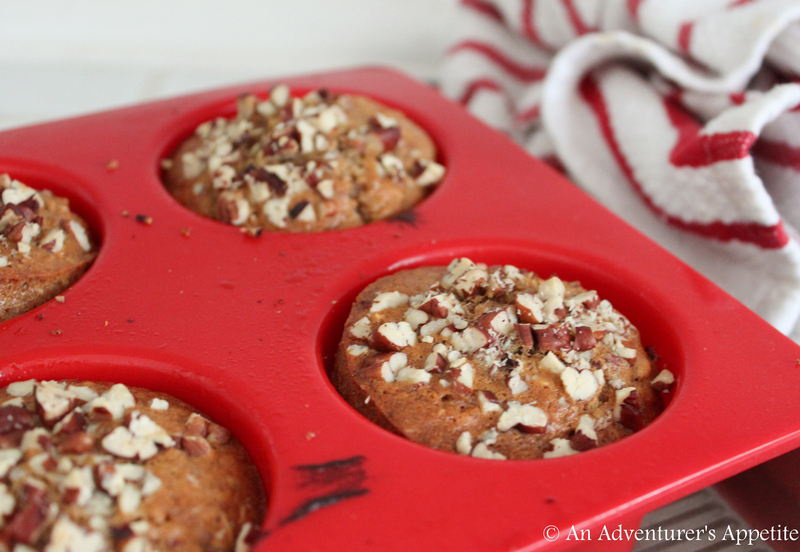 Pour batter into 6 pre-greased muffin tins. Top each with a sprinkle of chopped pecans. Bake for 22-25 minutes or until a cake tester/toothpick comes out clean. Once set, let cool for at least 5 minutes before removing the muffins from the tins. Serve immediately, or place in a sealed container for up to four days. To reheat, microwave for 45 seconds before digging in. Moving to a big city from a small college town has had one immeasurable foodie benefit: farmers’ markets. Portland has a wonderfully vibrant market community, which is not at all surprising given the city’s commitment to the small, the local, and the fairly-produced. Every week there are three farmers’ markets within walking distance from me (and a good handful more outside of my walking reach). There’s the Monday market downtown just a few short blocks away from my work – perfect for picking out some lunch time produce. Then the Thursday market has a quaint few sellers for me to pick up some quick dinner supplies. On Saturday mornings though, the Mother of the Markets opens on the campus of PSU. There are more than 150 vendors and food stands to choose from, including the best reason to get up early – Pine State Biscuits at an easy commute. 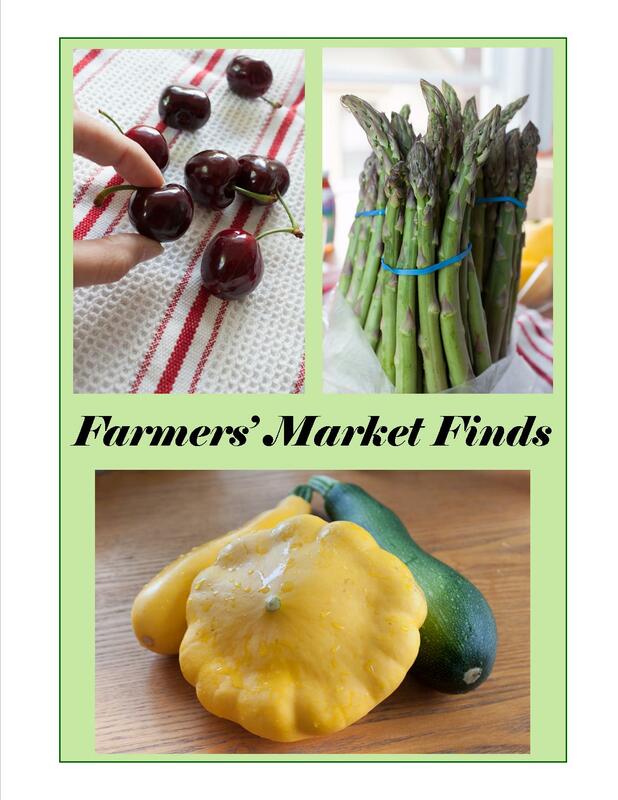 So this morning, I found gigantic cherries for $3.50 a pound, local asparagus at $8/3 bunches. The real value prize from the markets though, is the selection of squash and zucchini. 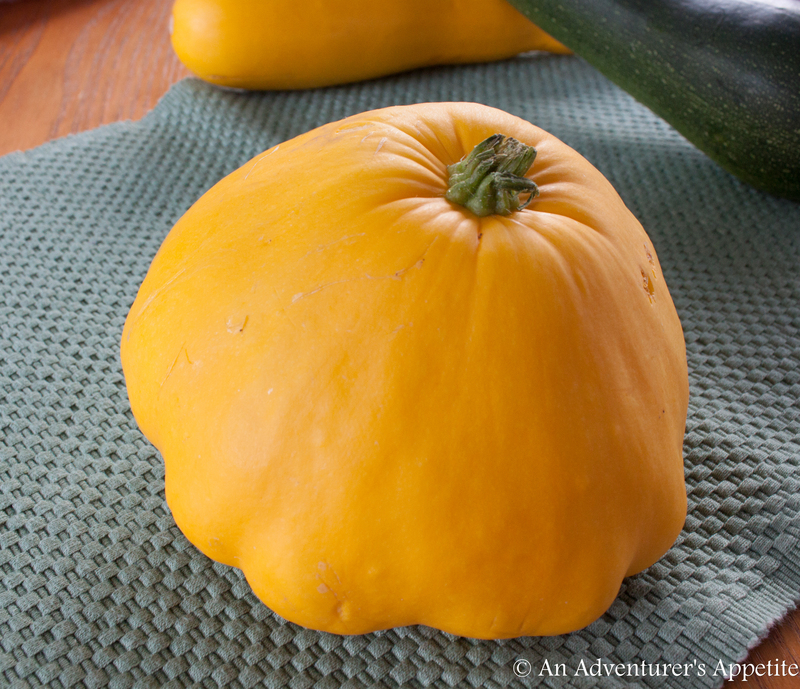 The traditional kind were $0.75 each, and we even discovered a new variety: patty pan squash! This gorgeous gem sold at $0.50 for a squash bigger than my spread hand. The fun flower-like shape came for free, of course. It was also much bigger than what I found at the supermarket when I looked for this particular variety. 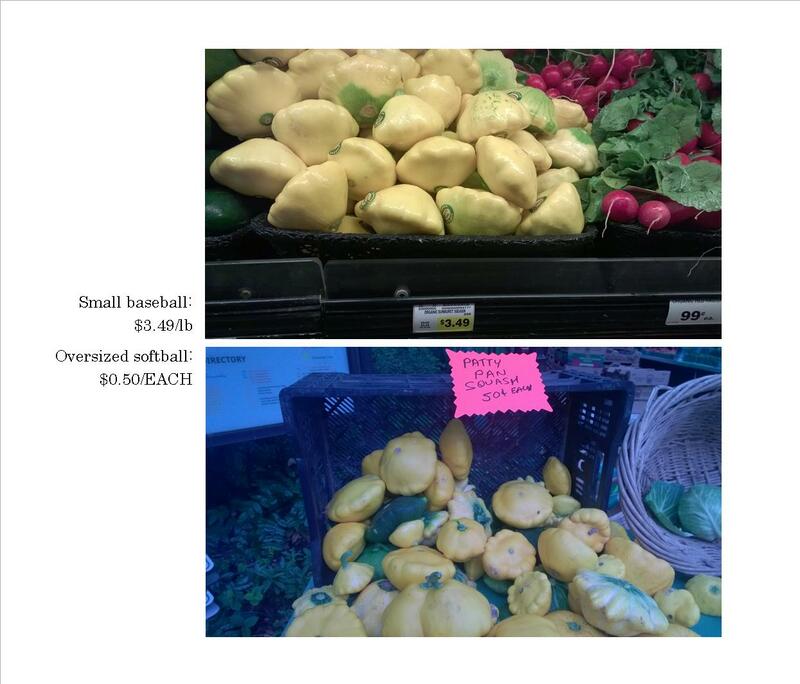 There it was called a “Sunburst Squash” and was closer to the size of the beets next to it. Which leads me to my first adventure for this blog! “Meet a Veggie” – Learning about new veggies and cooking techniques to expand my healthy cooking range. Just like traveling, new foods can be intimidating and foreign at first. But once we become accustomed to eating new foods, and learn how to prepare them, you can quickly feel just as at home with a bowl of beautiful new veggies as a tried-and-true pile of mashed potatoes. But for now — coffee. 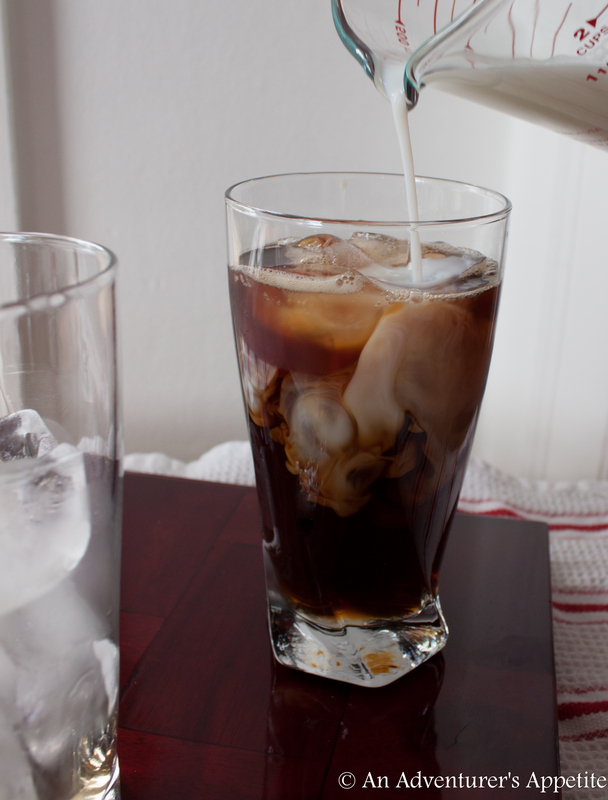 After a long morning of adventuring, I was craving a cool iced coffee. Sure, I could buy one for a few bucks and a plastic cup. But what fun is that? I kept with the simple syrup theme for this one, since it really is the best way to add flavor to a cold drink. A little caffeine, a little sugar and a little vanilla-flavored comfort, for less than $1 in supplies. Pour hot brewed coffee into a wide, deep pan so that it can cool. Cover loosely and set aside for 15 minutes. In a small saucepan over medium high heat, bring the water to a boil. Whisk in the sugar. Once dissolved and the liquid clears, add vanilla. Reduce heat to low and allow to simmer for 5 minutes, stirring occasionally. Remove from heat. Fill four 16 oz glasses 3/4 of the way with ice cubes. 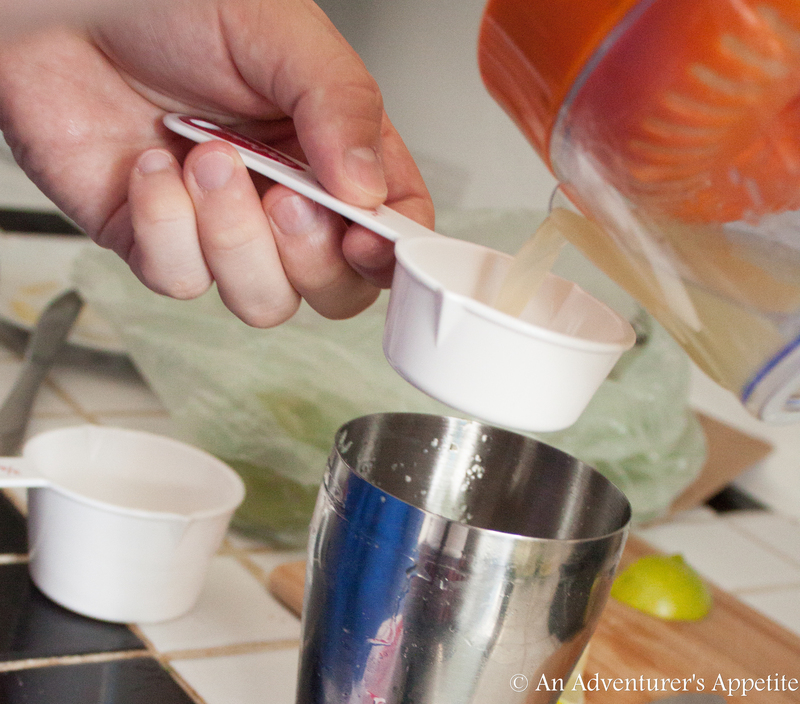 Measure 2 tablespoons of the simple sugar mixture into each of the glasses. Save any extra simple syrup in a small separate container in the fridge for up to 2 weeks. Pour coffee over each glass, stopping about 1.5″ from the top. Divide milk among each according to taste, using up to a 1/4 cup in each. Enjoy before the ice melts! After trying my first homemade fruit popsicle, I’m not sure I’ll ever go back to the frost-bitten ice blocks sold at the supermarkets. Except maybe for an good orange creamiscle. But once I master making those, the popsicle business might lose me for good. 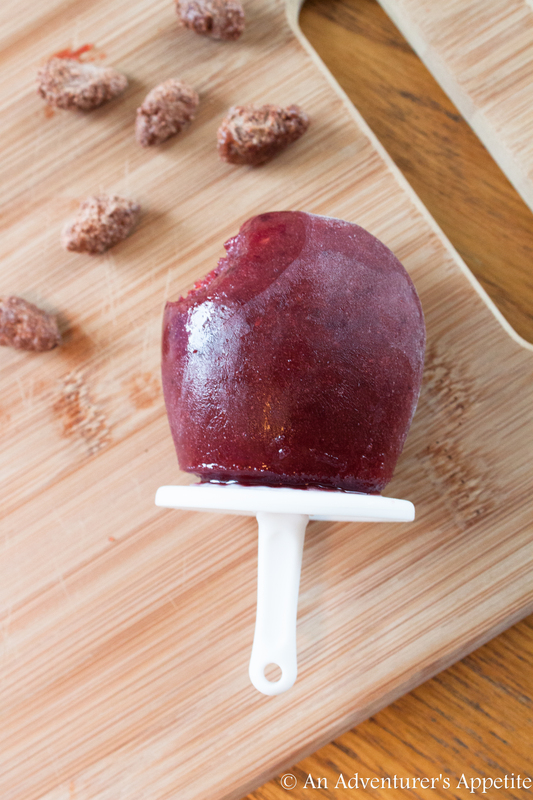 These homemade pops are bitable, lickable, and oh-so savorable. They are inspired by my favorite of pies: my mom’s unbeatable peach pie, and the All-American cherry pie. The secret ingredient to making both heavenly? And that’s exactly what you need to fuse these two rarely-friendly fruits together. Did I mention there’s an extra sweet treat? – A brown sugar simple syrup gives these pops a decadent smooth consistency for pouring and keeps them from breaking down into smaller chunks during the freezing. With all that fruit in there, you can still feel good about enjoying a healthy treat too! I originally tried a cheap $5 store brand, as a way to test if I would actually make popsicles, but my advice…? I don’t want you to suffer too, so please – do right by your popsicles. I scoured the internet reviews for popsicle molds, and judged the Zuku Slow Pops with the Rounded Silicon to be worthiest (aka best value). You’re welcome to find your own perfect match, but these have been simple to pour, clean and enjoy. My only critique is that the two pieces that fit together to make the base leak a bit. But what’s a summer popsicle without sticky fingers? 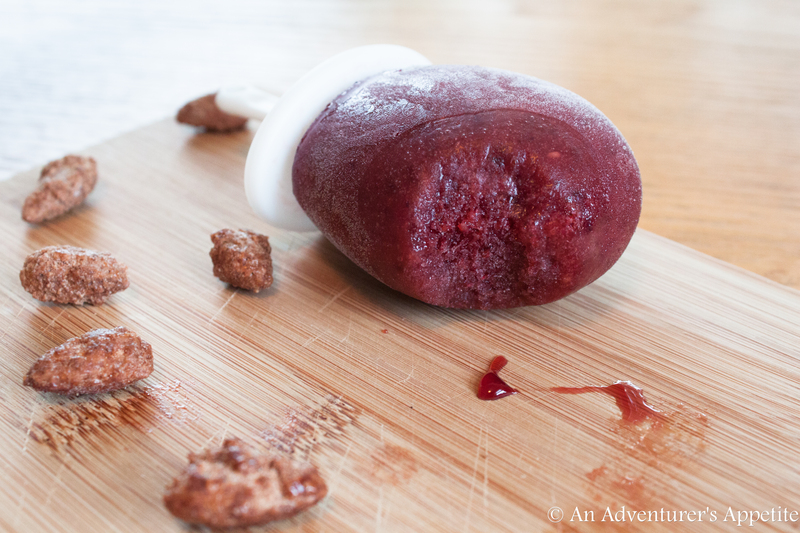 So here is my first pop-worthy popsicle recipe. Enjoy! In a small saucepan, bring the water to a rolling boil over medium-high heat. Whisk in sugar and reduce heat to medium low, keeping at a gentle simmer for 5 minutes. Stir frequently. Add almond extract, and keep over heat for another 5 minutes to allow syrup to thicken. Remove from heat and allow to cool while you prepare the fruit. 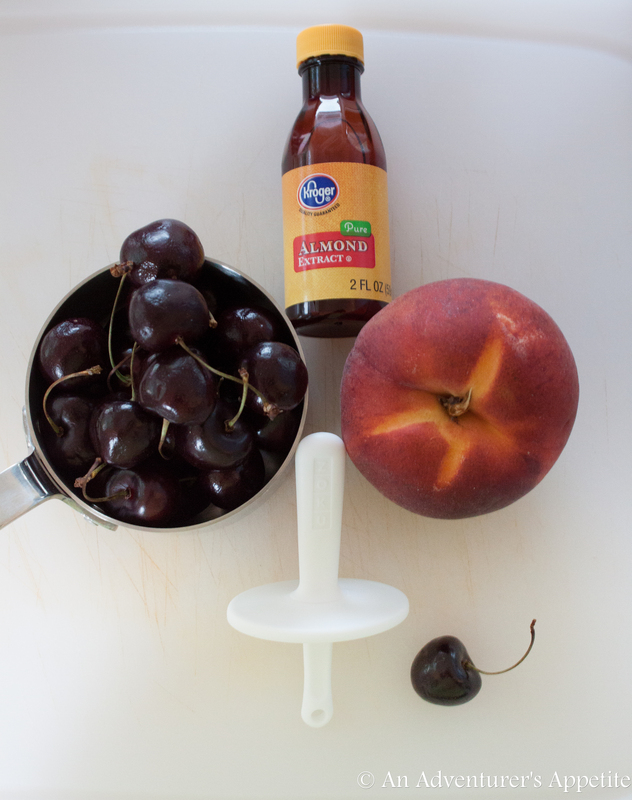 Using an immersion blender or full blender, blend together the peaches and cherries until smooth. Pour into clean popsicle molds. Enjoy individually or in droves.